Uber CEO Dara Khosrowshahi: "We have a very budding partnership with Toyota." NEW DELHI -- Toyota and Uber plan to team up on autonomous driving as technological changes sweep through the transportation industry. On Thursday, Dara Khosrowshahi, CEO of Uber Technologies, posted a photo on Twitter of him and Toyota President Akio Toyoda and Executive Vice President Shigeki Tomoyama at the automaker's headquarters. The Uber CEO is smiling and holding a black baseball bat from local hero Ichiro Suzuki, while Toyoda laughs at his side. "Having fun with Akio-San and Tomoyama-San @ToyotaMotorCorp HQ," he wrote. "Great discussions about growing our #autonomous partnership and lessons 4 me in building a great culture. And yep, those are Ichiro's bats." The cheerful snapshot encapsulates a partnership Khosrowshahi hopes to extend to other automakers. It's part of a plan to get autonomous vehicles in the Uber network on actual streets within a year, he told reporters during a media roundtable in New Delhi, the present leg of an Asian tour that's taken in Japan. Uber and Toyota have given few details of their collaboration on autonomous technology, though both have been active in the field separately. Toyota bought a stake in Uber in 2016, without disclosing the size or the reason for the investment. Khosrowshahi wouldn't elaborate except to say Uber's committed to self-driving vehicles for commercial profit. "In less than a year, autonomous vehicles will be on the road in our network," he said in Delhi. "Much sooner than you would expect." Khosrowshahi is looking to move past an embarrassing legal battle with Google parent Alphabet, which alleged that Uber stole autonomous driving secrets. Having settled that case this month for about $245 million in stock, Khosrowshahi's meeting with Toyoda shows his commitment to continue developing the technology with partners. For Toyota, closer ties could help it keep up with rivals like Nissan Motor, which is working on its own autonomous solution. "We have a very budding partnership with Toyota," Khosrowshahi told investors at an event on Tuesday. "We have to make sure we have access to leading autonomous technology. And that means having access to it in a timely manner. I do believe we can develop our own autonomous technology that we’re doing, and at the same time partner with other players in autonomous technology." 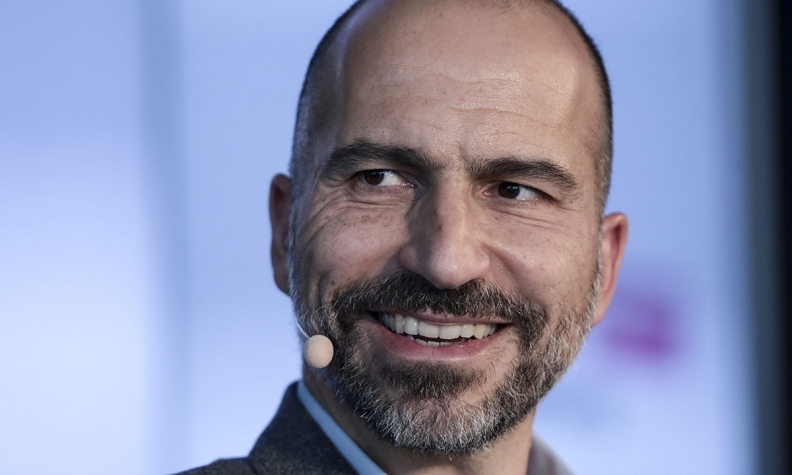 During his Asian trip, Khosrowshahi made it clear the ride-hailing company isn't scaling back its ambitions in certain regional markets, despite speculation of a retreat. It will keep investing to become No. 1 in the country versus local rival Ola, he said. In Japan, Uber's willing to forge partnerships with Japanese taxi companies in order to succeed, though Uber has less than 1 percent market share and only offers limited services there. "It's clear to me that we need to come in with partnership in mind," Khosrowshahi said this week. It's a clear sign that the ride-hailing giant will redouble efforts to take a piece of Japan's $16 billion taxi market, even amid signs of pressure from its biggest shareholder, SoftBank Group, to focus on core markets. Amid heavy operating losses, Uber has retreated from some markets, including China and Russia. It's also said to be considering a sale of its Southeast Asian business. On Thursday, Khosrowshahi said Uber's board will dictate its strategy and that the Japanese company’s opinion was but one of many. Uber still faces an uphill battle in SoftBank's home country. Local rivals such as Nihon Kotsu, Tokyo's largest cab company, have already released popular taxi-hailing apps. Uber's Chinese rival Didi Chuxing last year began partnership talks with taxi operator Daiichi Koutsu Sangyo, with the discussions facilitated by SoftBank, a person familiar with the matter told Bloomberg in October. Uber is also said to be in talks for a venture with Daiichi Koutsu.